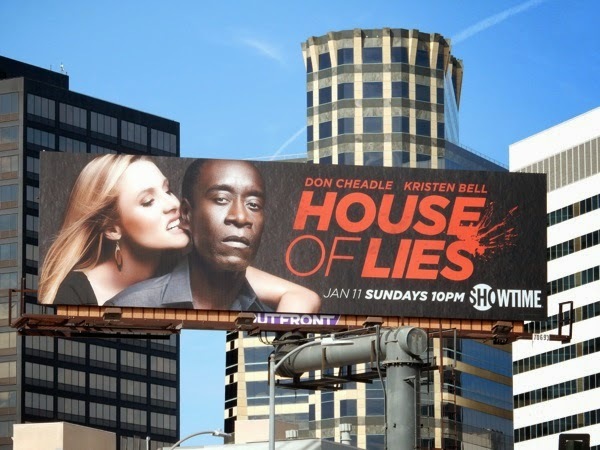 You know that old saying, 'keep your friends close and your frenemies closer', well it looks like Kristen Bell's 'Jeannie van der Hooven' will be cosying up with Don Cheadle's 'Marty Kaan' this season on House of Lies, but is it because we'll discover she's pregnant on the show (as she is in real life)? At the end of last season Marty's questionable business dealings caught up with him when the Feds came a-knocking, so maybe that face is because of the time he's spent in prison, where hopefully he's learned some valuable life lessons (although we kinda doubt it). 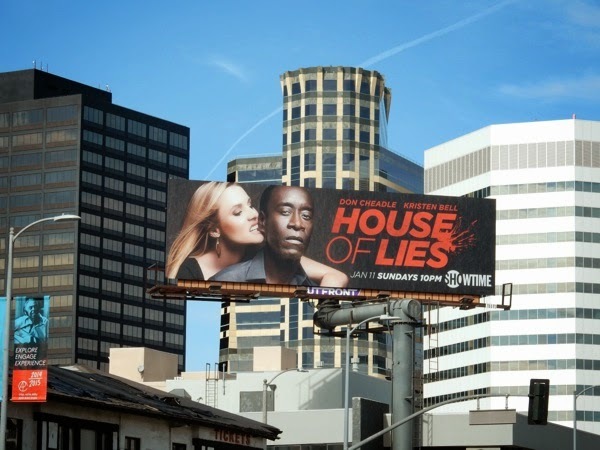 Can this couple of wheeler-dealers stick it out as a couple, or will they be too busy keeping Marty's firm together? 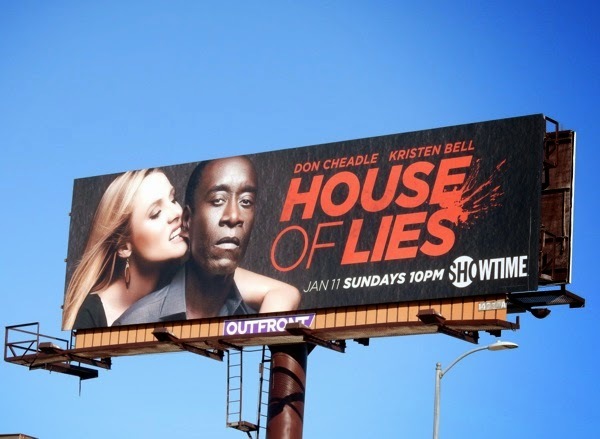 Although after this year's Golden Globes award ceremony, maybe the real question is, would Don Cheadle rather be in House of Cards than House of Lies, like Jane Fonda made the mistake of saying. 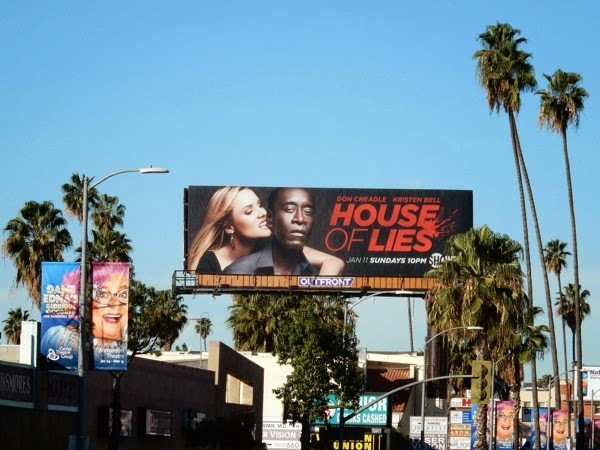 These ear-nibblingly good billboards for the popular Showtime series fourth season were snapped along Hollywood Boulevard on January 15 and along Westwood Boulevard and La Cienega Boulevard on January 22, 2015. 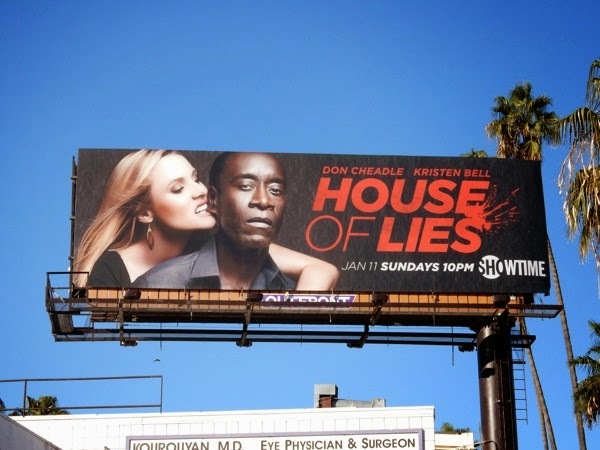 If you're a fan of the show, be sure to check out these previous season promo billboards for House of Lies.